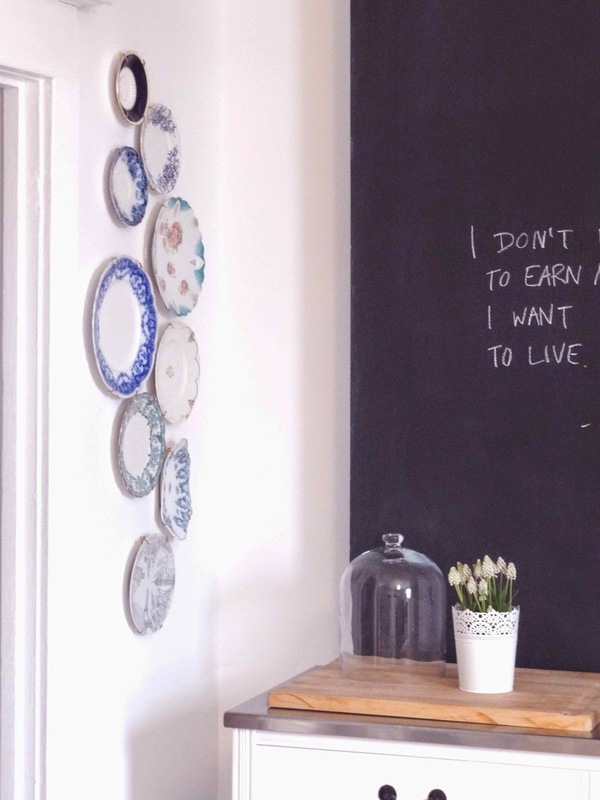 How do you feel about wall plates? 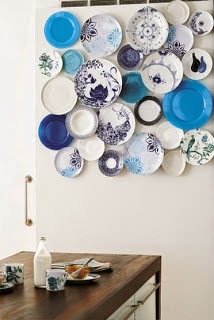 To some people, a cluster of plates is a quirky, clever and even modern way to add visual interest to a vertical space. Yet to others wall plates scream 70's and are best left wherever all the 'avocado' appliances went! 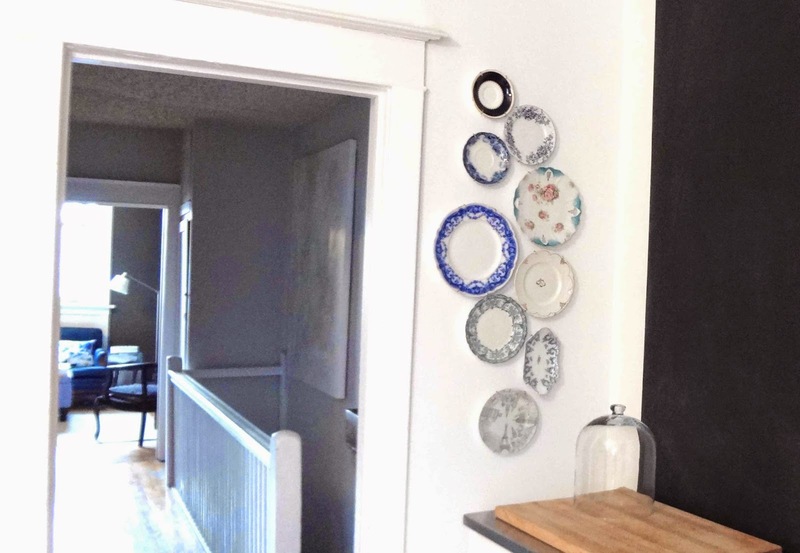 I happen to like a display of wall plates, but I'll admit that when this trend went viral on pinterest a couple of years ago, I thought the look was cottage cool and not great for city spaces. I've since changed my mind about that. 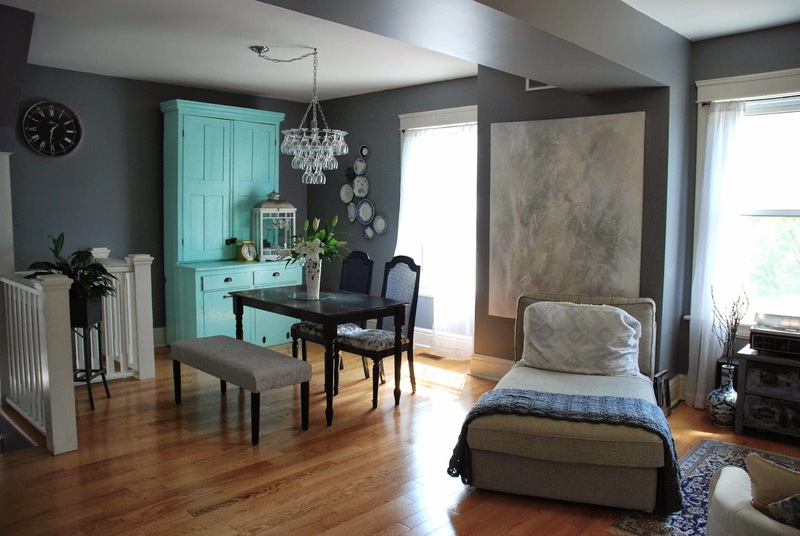 Don't let your 'gut' feelings about this trend influence your final decision! 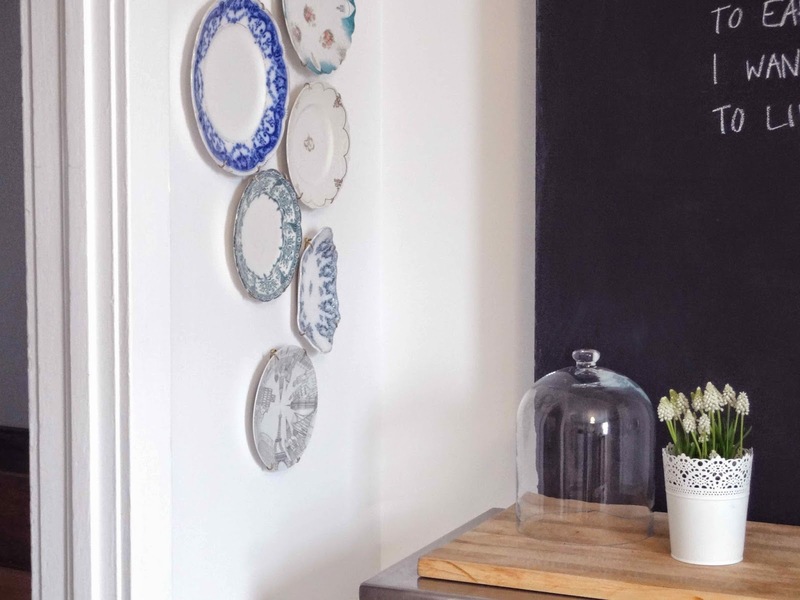 We may never shake the dusty image of our grandmother's dining room plate rail, but in our current homes a display of wall plates can be incredibly versatile. Pretty incredible, no? I always absolutely love the use of a scallop pattern! 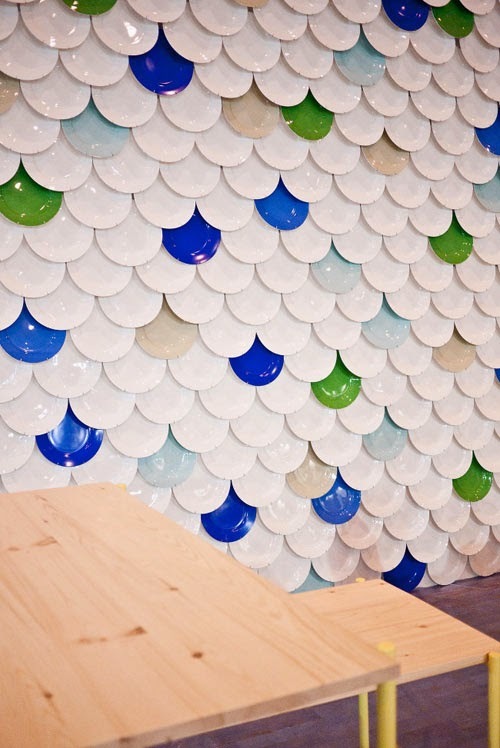 It's immediately playful and feminine but it has the depth and simplicity of a pattern that is found in the natural world (fish scales). 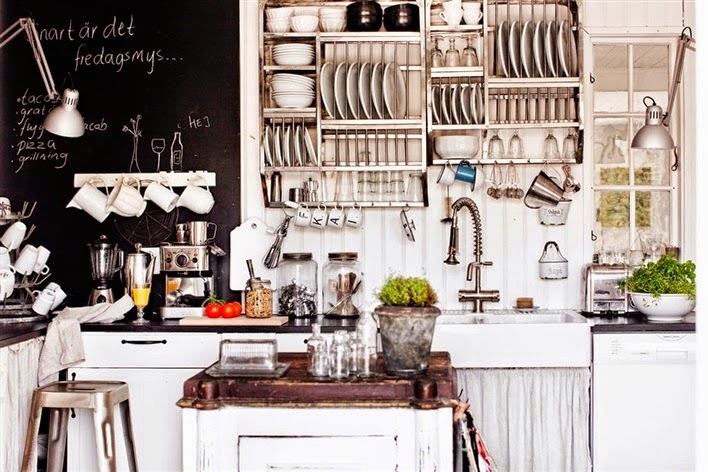 Don't you just love the way all the functional kitchen items come together to create this interesting and eclectic space? 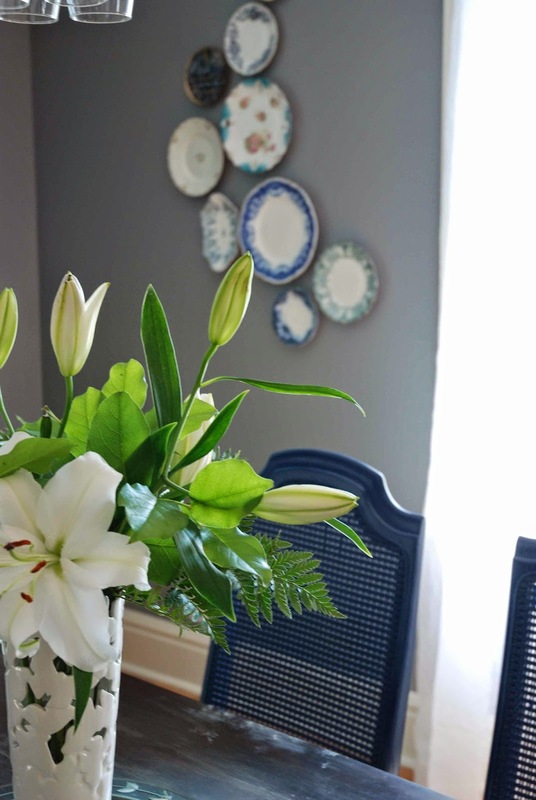 The photos of the entire house can be viewed on My Scandinavian Home (one of my favourite blogs). 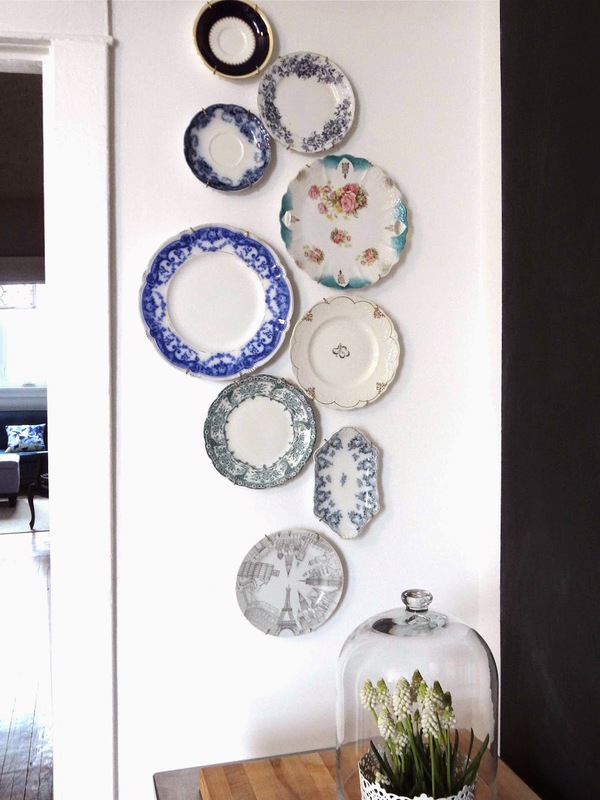 So with all that in mind (unique and eclectic spaces + lovely modern plate designs) I decided that it was time to hang my collection of wall plates in our Toronto home! And since our kitchen is already quite 'cluttered' (in a good way), it just seemed like I may as well squeeze in a bit more stuff. First, I had to decide what sort of formation would work best for my space. 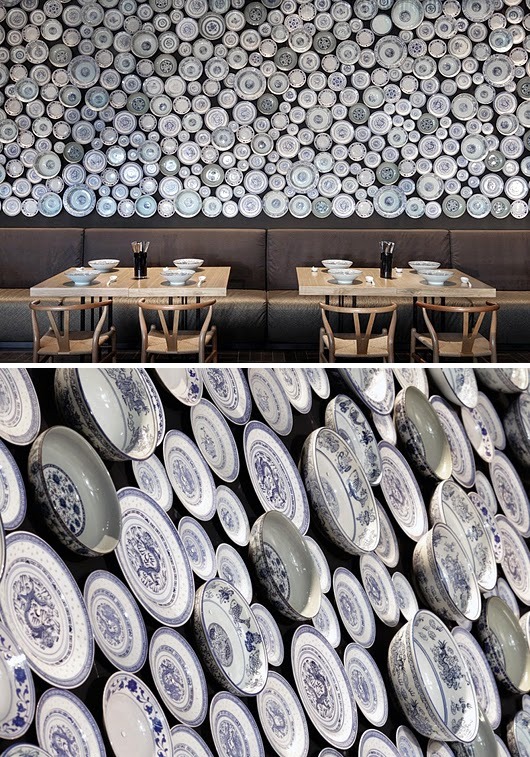 I searched 'wall plates' on pinterest and these were the two images that stood out to me (I know, I am a sucker for anything blue!). I like the free floating runaway sense of the display on the left, and I also like the crowded and clustered feel of the plates on the right. 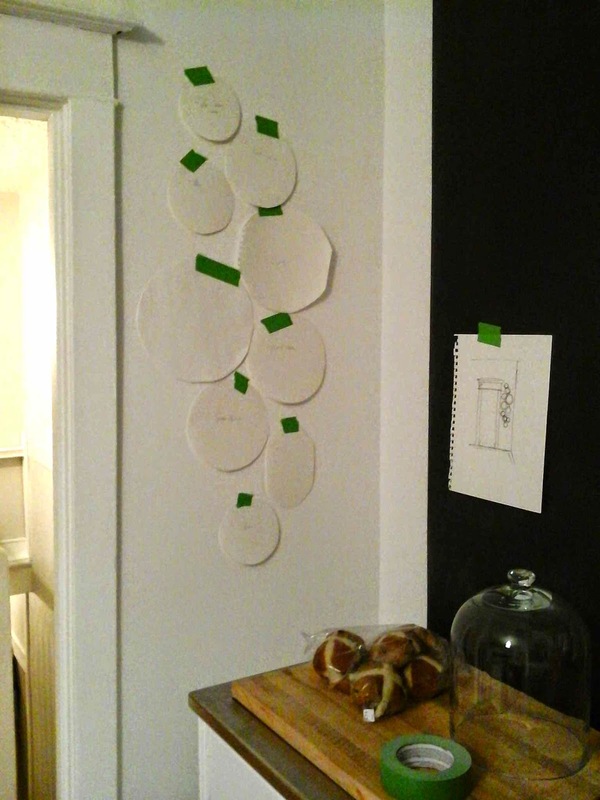 Next, I did two quick sketches to help me realize how each formation would translate in my space (which is in the corner by the kitchen doorway). 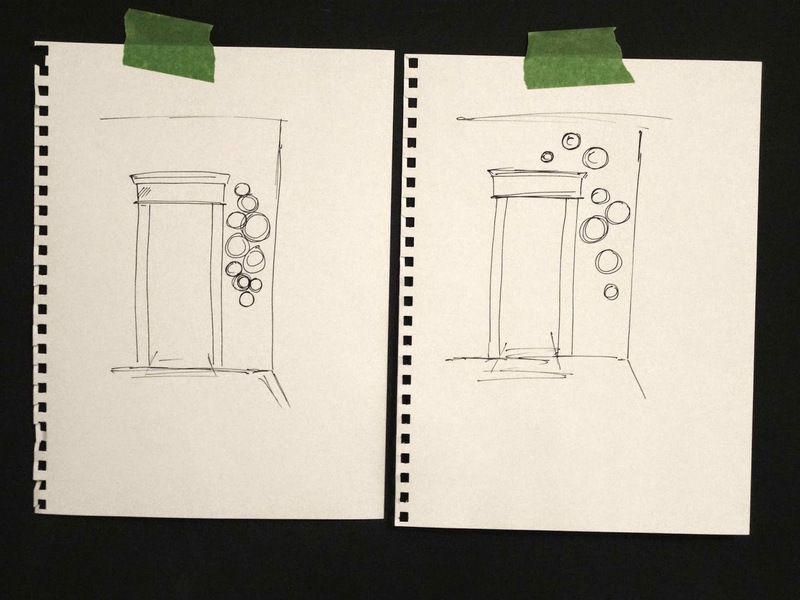 After pondering the drawings at great, great length :) , I decided to go with the cluster design. 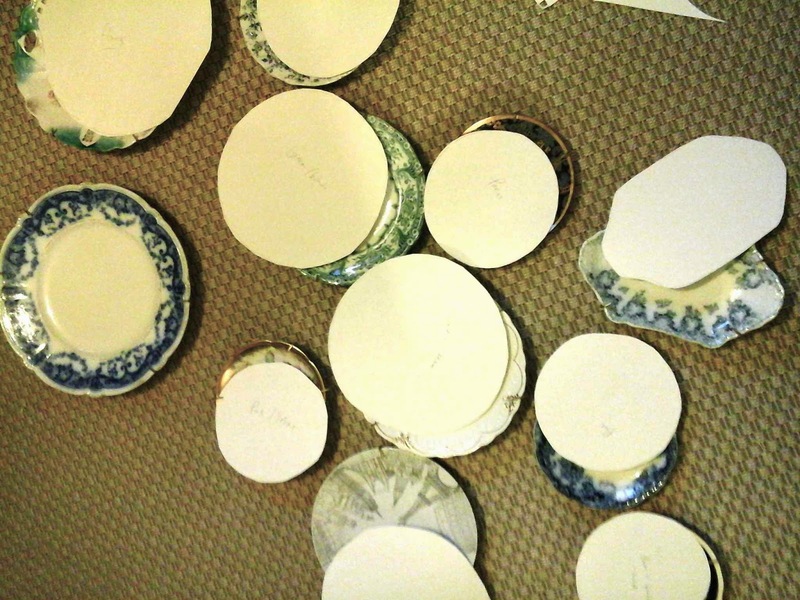 Time to hang the plates! So how do you do it? 1. 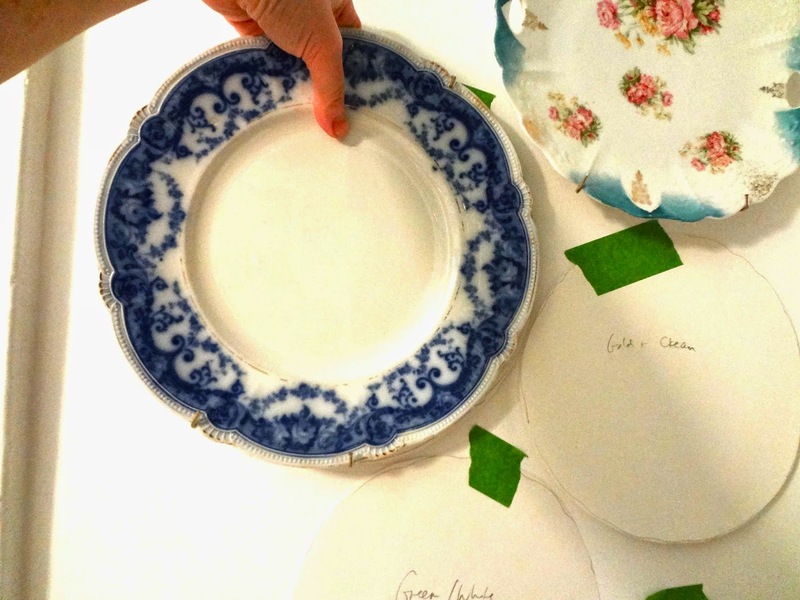 Trace each plate and cut out templates. 2. 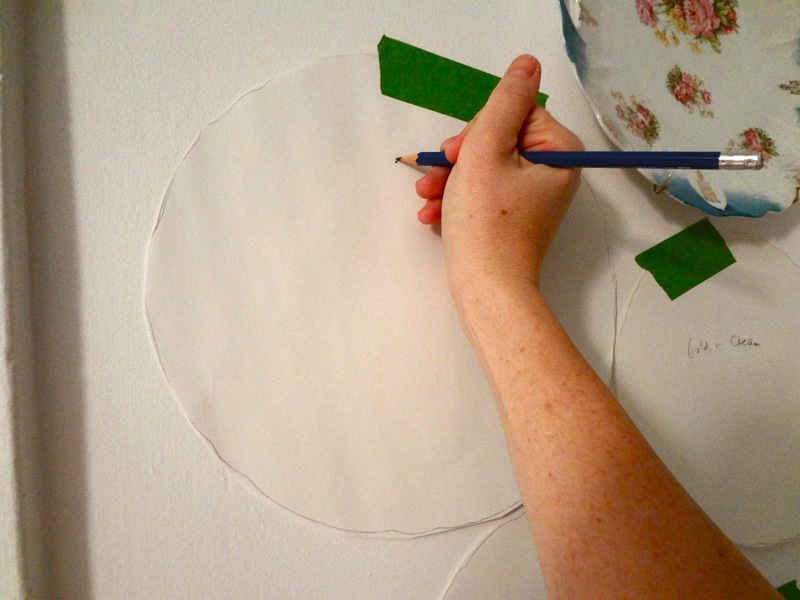 Stick the templates up in desired formation. 3. 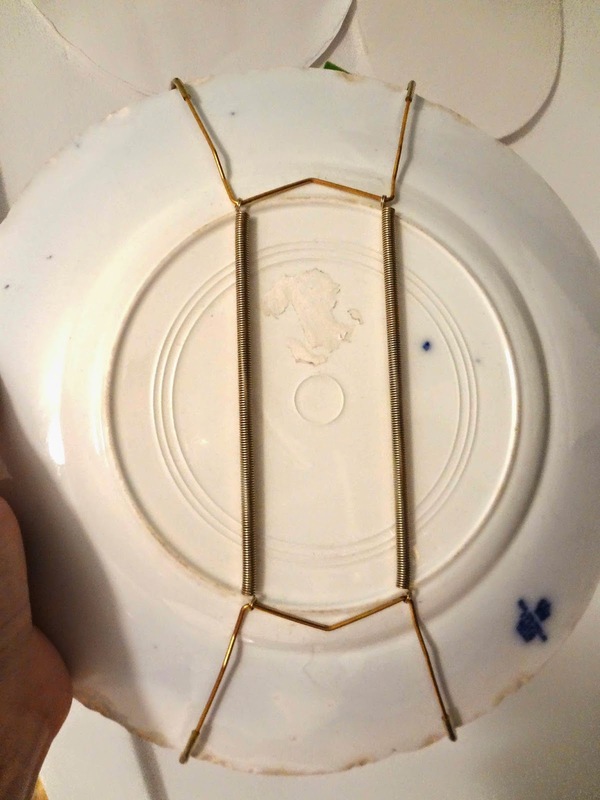 Attach a plate holder to each plate. 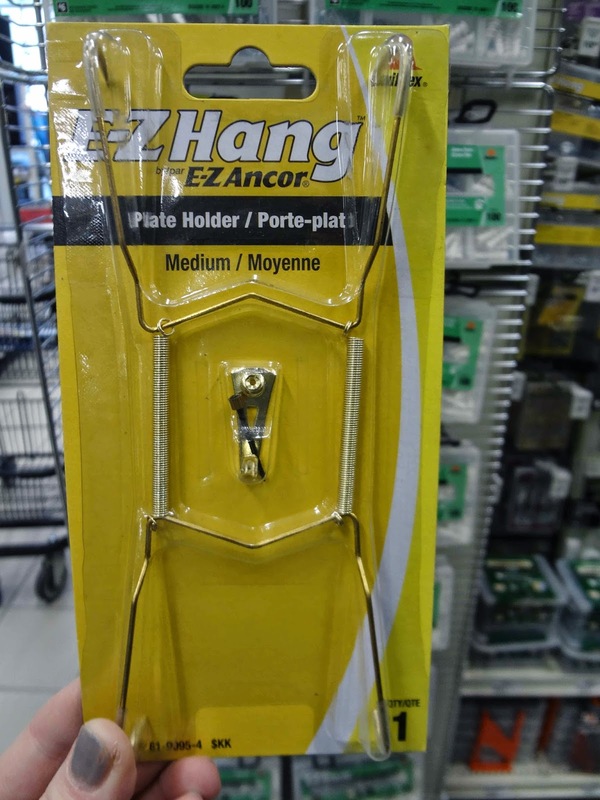 (Plate hangers or holders are sold at hardware stores and can be found with the picture hooks. 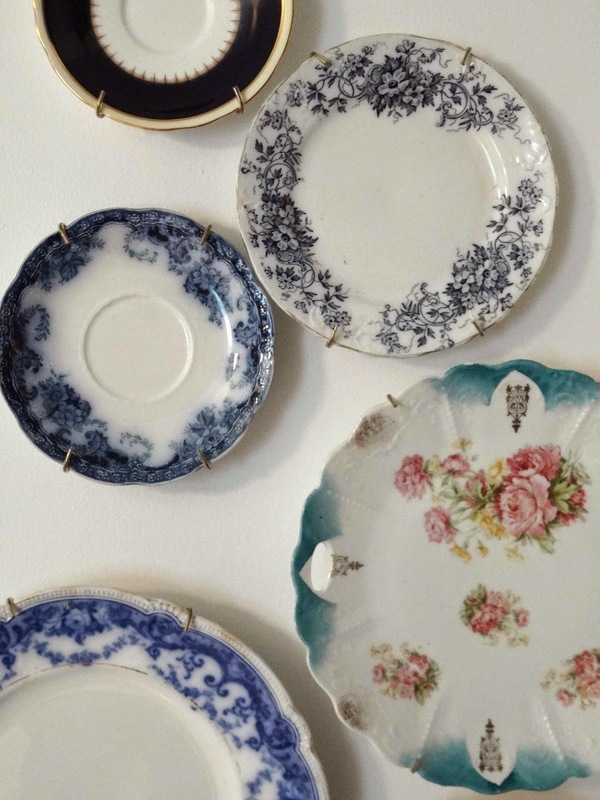 They come in small (saucer or dessert plate), medium (dessert or salad plate) and large (dinner plate, 12") and contain the wall hook needed to hang the plate holder. (the part that will latch onto the wall hook). this is where the hook needs to go. 6. 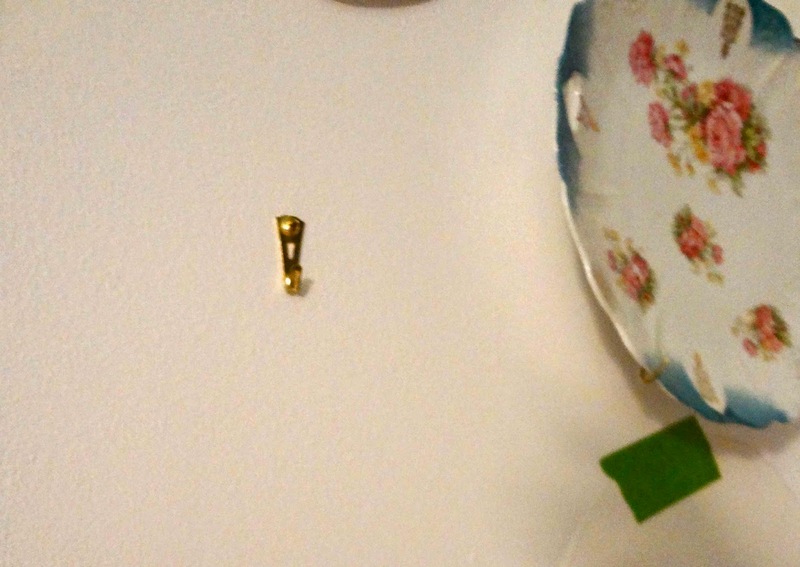 Using a hammer, nail the plate holder hook into the wall just enough to make a mark. Remember, where the holder tip will sit is where the actual 'hook' has to go, not where the nail goes. 7. 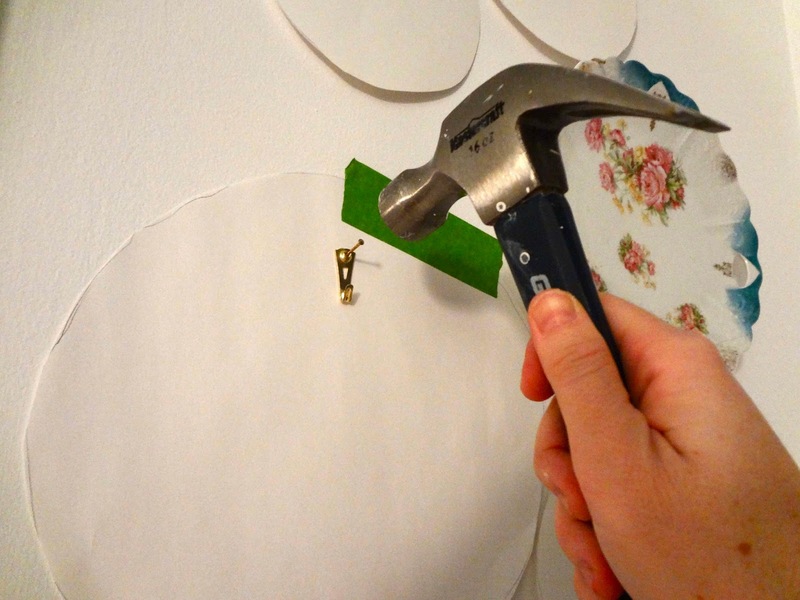 Remove the hook and the paper, then find the hole and nail the hook in for good. 8. 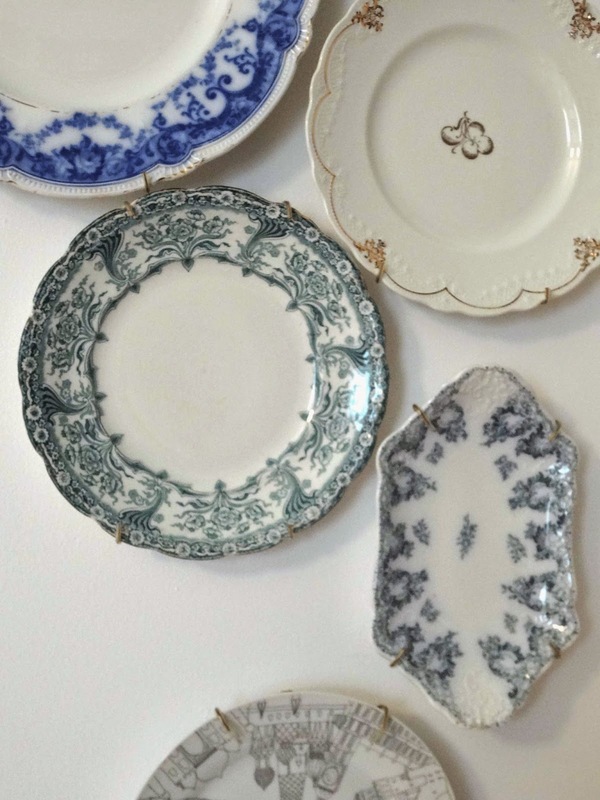 Hang up your plate! Here is the finished plate display. 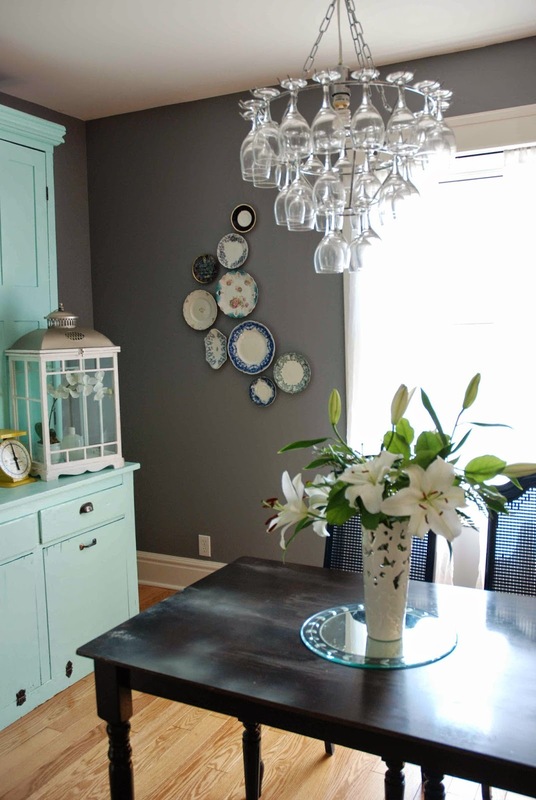 I think it works very well in our cluttered, much loved kitchen. Hope you're enjoying this terribly snowy April Tuesday! 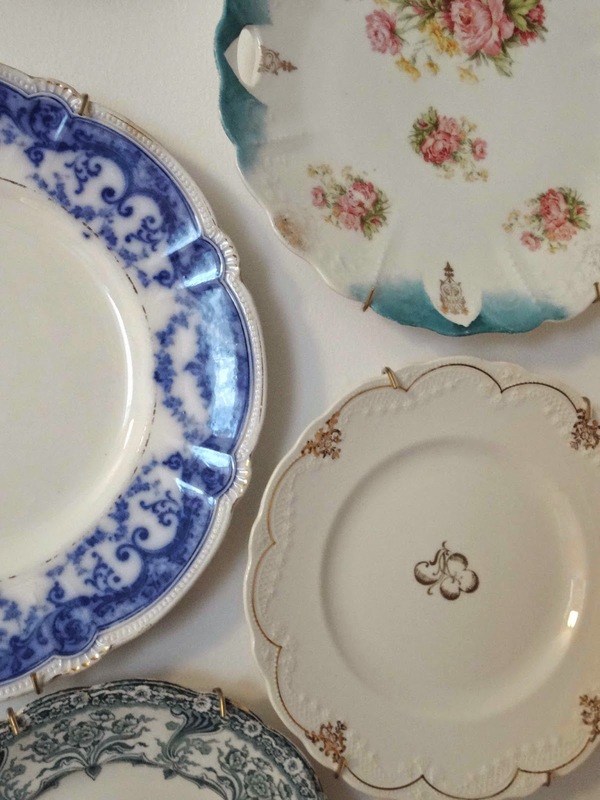 I was trying to wait for a bright and sunny day to photograph the plates, but I just wasn't getting one. Decided to just go ahead and post my snapshots. 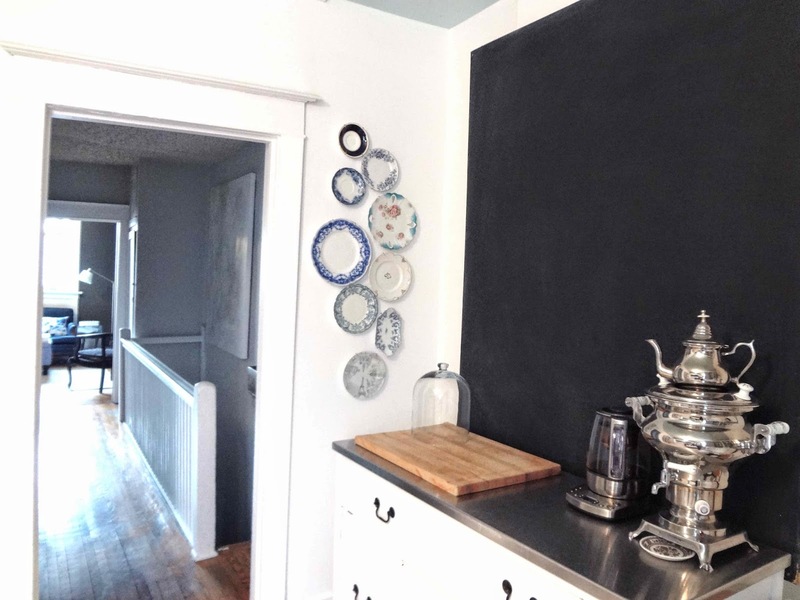 Hope to have some better pictures taken when I finally get around to blogging about the finished kitchen. Only a few more small projects and the whole room will be done! It's looking gorgeous. People are now looking for wall mat to extend the beauty. 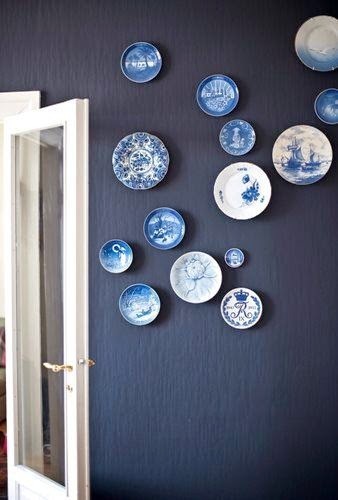 Sometime they use the printings to make the wall mesmerizing looking. You can print from any online printing services which has good service.